It was 7am on Sunday 17th September and my friend Kirsty (also a Sandhurst Jogger) and I were heading off to run our first half marathon since we started running together and since joining Sandhurst Joggers a few months ago. It was during this journey that we hit our first hurdle – the M3 was shut so we needed to follow the diversion up to Richmond. The race started in Kew Gardens and would finish in Old Deer Park so we decided to park near the finish in Richmond and then took the tube one stop up to Kew. On arriving at the entrance of Kew Gardens we began to realise just how big this event was as we had to queue to enter the park whilst they were carrying out bag searches. Once inside the park we were quickly ushered along towards where the race would be starting and then proceeded to join what seemed like thousands of people needing to use the far too few portaloos near the start. Our start time was drawing closer and closer and the first waves proceeded to begin. After a half hour wait, we finally made it to the loos after which we time we had to make a speedy dash back the way we came back to the bag drop. We made it back to the start just as everyone in our wave was heading to the start so we joined the back of the pack with literally seconds to spare. The first mile was pretty slow, the paths through Kew gardens were quite narrow so it was quite congested. After about the first mile, I found a gap to squeeze through and that was the last time I saw Kirsty and we ended up running the rest of the race separately. The first few miles were lovely, running through the Gardens. There were a few people dressed up along the way to support the runners, people singing and music playing. There was a guy running by me at this time who made me chuckle as he stopped for a dance and to take a selfie with someone dressed as a bear. I admired how he was embracing the whole event and not just focusing on his running performance. We then made our way down to the tow path which followed the River Thames for much of the rest of the run. The tow path created some tight spots at times, and again caused some congestion. Some runners were getting frustrated as they were being held up by others but I just carried on and enjoyed the run. The path was also bumpy in places and I saw a few runners take a tumble. Although there were a lot of runners, the tow path stretch could at times feel quite lonely with few opportunities for crowds to stop and cheer us along. Along the tow path stretch, I noticed this guy (I later found out he was called Jack) running who I had seen earlier in the race and thought he must have been going a similar pace to me so I kind of used him as my marker as I continued. He passed me a couple of times and I passed him a couple of times and as we reached the end of the tow path at Teddington we were running together. As I turned the corner at Teddington Lock, I noticed some relatives who had come to cheer me on so it was nice to see some familiar faces and have some support. However, it was at this point that I lost Jack and he went on ahead of me. The route then took us away from the river and back onto the road and it was quite nice to be back on hard, level ground once again. After another couple of miles, we headed back towards the tow path again and I had managed to catch Jack up again. This was the first time we spoke and he told me that he wondered where I’d gone as he’d been using me as his marker. We then ran the rest of the race together and it was nice to chat to someone for a bit. 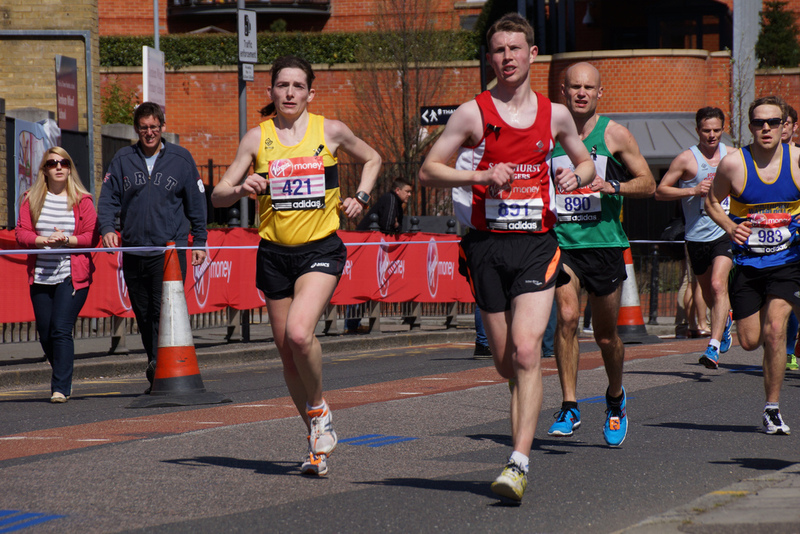 I ran my first half marathon in Bracknell back in May, which I ran in 1.56:16 so I was quietly hoping that I might be able to match that time, if not beat it. As I neared the end of the race, I checked my time and was pleased to see that it would be tight, but I could do it. I crossed the finishing line in 1.55:15 so was pleased to beat my Bracknell time, and had it not been for the congestion I might have knocked a few more seconds off the clock. The end of the race brought with it lots of goodies apart from the usual medal and t-shirt. You helped yourself to all the drinks and snacks you wanted and could even have a free pint of beer. Overall, I was really pleased with my run, managing to maintain a steady pace around most of it, with only 2 miles going over 9 min/miles (which is when it was most congested) and would happily run the race again. Bad points – narrow at times and the queue for the toilets!